A Few Random Facts Where in the universe is the Earth? How fast are we traveling through space?? How fast does light travel? How far is it to space, the Moon, the Sun, the stars, etc? How many stars are there? How does the Sun shine? What different types of stars are there? What is the human body (and the Earth, the Sun, the Universe) made of? How many molecules/atoms are there in each cubic meter? What if the history of the universe were squeezed into the period of one year? What are the coldest and the hottest objects in the universe? What is the electromagnetic spectrum? What is a planet? What is a dwarf planet? Why do the planets orbit the Sun? A star begins its life as a cloud of dust and gas (mainly hydrogen) known as a nebula. A protostar is formed when gravity causes the dust and gas of a nebula to clump together in a process called accretion. As gravity continues to pull ever more matter inward towards the core, its temperature, pressure and density increases. If a critical temperature in the core of a protostar is reached, then nuclear fusion begins and a star is born. 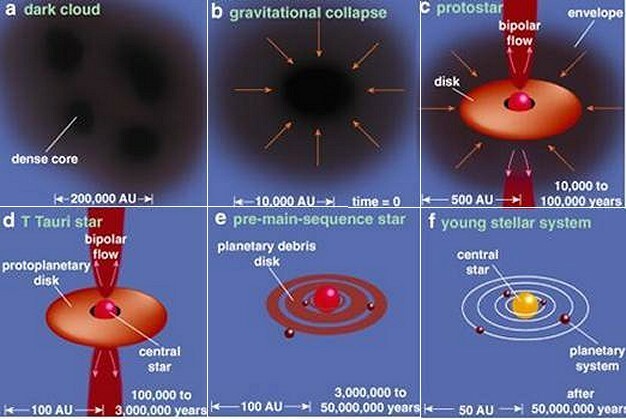 If the critical temperature is not reached, however, it ends up as a brown dwarf, or dead star, and never attains star status. A typical star like our own Sun (technically a yellow dwarf star), then, is fuelled by nuclear fusion, the conversion of hydrogen (the simplest atom, with a nucleus consisting of just one proton) into helium (the second simplest, with two protons and two neutrons in its nucleus). The nucleus of a helium atom actually weighs only 99.3% as much as the two protons and two neutrons that go to make it up, the remaining 0.7% being released as heat and light energy. This 0.7% coefficient, which is essentially due to the extent to which the strong nuclear force is able to overcome the electrical repulsion in the atoms, turns out to be a critical one in determining the life-cycle of stars and the development of the variety of atoms we see in the universe around us. The Sun's own gravity traps and squeezes this ultra-hot gas into a confined space, thus generating enough heat for the fusion reaction to take place. The process remains in equilibrium as long as it retains enough fuel to create this heat- and light-producing outward energy which counteracts the inward pressure of its gravity (known as hydrostatic equilibrium). This is the period known as the main sequence of the star. Already about 4.5 - 5 billion years old, when the Sun's hydrogen fuel starts to run out (in an estimated further 5 billion years or so), its main sequence comes to an end, and it starts to cool down and collapse under its own gravity. However, energy from the collapse then heats up the core even more, until it is hot enough to start burning helium and, under the extra heat of the helium burning, its outer layers expand briefly (for a "mere" 100 million years) into a massive red giant star. Eventually, the outer layers blow off completely and the core settles down into a white dwarf star, a small cinder about the size of the Earth composed mainly of carbon and oxygen. Over a very long stretch of time, white dwarfs will eventually fade into black dwarfs, and this is the ultimate fate of about 97% of stars in our galaxy. The matter which makes up white and black dwarfs is largely composed of, and supported by, electron-degenerate matter, in which the atoms making up the star are prevented from further collapse by the effective pressure of their electrons, due to the Pauli Exclusion Principle (which states that no two electrons can occupy identical states, even under the pressure of a collapsing star of several solar masses). However, a star significantly larger than our Sun is hotter and burns up its fuel more quickly and generally has a shorter but more dramatic life. A star of ten solar masses, for example, would burn fuel at about a thousand times the rate of the Sun, and would exhaust its hydrogen fuel in less than 100 million years (compared to the Sun's 10 billion year lifetime). A star 20 times the mass of our Sun would burn its fuel 36,000 times faster than the Sun, and might live only a few million years in total. Larger stars are much hotter and the higher temperatures within such a star are sufficient to fuse even helium. The helium then becomes the star's raw fuel, and it goes on to release ever higher levels of energy as the helium is fused into carbon and oxygen, while the outer layer of hydrogen actually cools and expands significantly in the star's red giant phase. Even larger stars continue in further rounds of nuclear fusion, each of successively increased violence and shorter duration, as carbon fuses into neon, neon into magnesium and oxygen, then to silicon and finally iron. So, although a star the size of our own Sun does not progress very far along this path, a larger star continues through a chain of transmutations to progressively heavier nuclei. Eventually, a star of sufficient initial mass becomes a red supergiant, which has a core layered like an onion, with a broad shell of hydrogen on the outside, surrounding a shell of helium, and then successively denser shells of carbon, then neon, then oxygen, then silicon, and finally a core of white-hot iron. The iron in the star's core is very resistant to further fusing, however high the temperatures, and the heat from its nuclear fusion is no longer sufficient to support it against its own crushing gravity and it will suddenly and catastrophically collapse. The final collapse of a massive star under its own gravity happens incredibly quickly: in a thousandth of a second it can shrink from thousands of kilometers across to a ball of ultra-condensed matter just a few kilometers across. This rapid collapse results in a massive rebound when the core reaches the density of an atomic nucleus, like a ball bouncing off a brick wall, resulting in ultra-hot shock-waves which are imparted to the rest of the star. In this way, the star ultimately ends its life in a cataclysmic explosion known as a supernova, and for a few short weeks it burns as brightly as several billion suns, briefly outshining the star's entire home galaxy. For example, the supernova whose remnants we see today as the Crab Nebula, was recorded by Chinese astronomers in the year 1054 as visible to the naked eye for several months, even in the daytime, and bright enough to read by at night, despite its being about 6,500 light years away. The visible light of a supernova, though, represents only about 1% of the released energy, the vast majority being in the form of ultraviolet light, x-rays, gamma rays and, particularly, neutrinos. The conditions in the blast of a supernova are even hotter and more violent than in the core of the old star and this finally allows elements even heavier than iron to be created, such as radioactive versions of cobalt, aluminum, titanium, etc. In the process of its explosion, a supernova blows out into space a nebula of debris containing a mix of all of the naturally-occurring elements, in proportions which agree closely with those calculated to exist on earth. 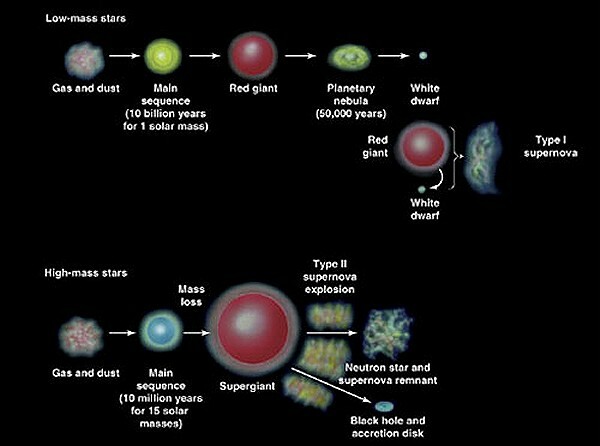 The variety of atoms in the dusty cloud from which our own Sun (and the Earth itself) were formed 4.5 billion years ago were essentially the ashes of generations of earlier stars having run through their entire life-cycles. Supernovas are therefore ultimately responsible for providing the mix of atoms on Earth, and the building blocks for the intricate chemistry of life. Most of these building blocks (carbon, oxygen, iron, etc) were therefore not produced in the Big Bang at the start of the universe - at the time the very first stars were being formed, their composition would have been about 75% hydrogen and 25% helium with just traces of the next heaviest element, lithium - but much later in the center of stars and their supernova explosions. It is in this respect that people talk of humans as being composed of "stardust" (or, for the less romantically inclined, nuclear waste). When a star explodes as a supernova, most of its matter is blown away into space to form a nebula (such as the Crab Nebula). The ultra-dense remnants of the imploding core which are left behind are known as a neutron star, as its electrons and protons are crushed together in the huge gravity to form neutrons. In 1935, the young Indian-American astrophysicist Subrahmanyan Chandrasekhar established that there is in fact a limit, known as the Chandrasekhar limit, of about 1.4 solar masses above which a star must continue to collapse under its own gravity into a neutron star rather than settling down into a white dwarf (a similar discovery was made around the same time by the Russian scientist Lev Davidovich Landau). A neutron star is typically between 1.4 and 4 times as massive as our own Sun, but is squeezed into a volume only about twenty kilometers in diameter, and so has an extremely high density. Given that, as Sir Isaac Newton pointed out as long ago as the 17th Century, gravity is subject to an inverse-square law (so that as the distance from the source decreases, gravity increases by the square of that amount), the gravitational pull of a small, dense neutron star is much greater than that around a normal star of many times its size. In fact, the gravitational force on a massively dense neutron star is about a million million times fiercer than on the Earth, and a projectile would need to attain almost half the speed of light in order to escape its gravity. Under conditions of such powerful gravity, Sir Isaac Newton's Law of Universal Gravitation (which generally works well enough in our own Solar System) becomes redundant, and the more sophisticated model of Albert Einstein's General Theory of Relativity is needed. Thus, clocks on a neutron star would run 10 - 20% slower than those on Earth, and any light from its surface would be so strongly curved that, viewed from afar, part of the back of the neutron star would be visible as well. Because neutron stars retain the angular momentum of the original much larger star, they usually rotate at very high speed (as fast as several hundred times per second in a newly formed neutron star), in the same way as an ice skater spins faster as she tucks in her arms. In some cases, their intense magnetic fields sweep regular pulses of radio waves across the universe, for which they are known as pulsars. We know of about 2,000 neutron stars in our own Milky Way galaxy, the majority of which were detected as radio pulsars. A particular type of large neutron star known as a magnetar has a particularly powerful magnetic field (up to a hundred trillion times the strength of the Earth's magnetic field), which powers the emission of copious amounts of high-energy electromagnetic radiation, particularly X-rays and gamma rays, as it decays over a period of around 10,000 years. Perhaps 1 in 10 neutron stars develop as magnetars. But, what does all this have to do with black holes? Read on to find out. The articles on this site are © 2009-.